Technology has fractured democracy, and now there's no going back. All around the world, the fringes have stormed the palace of the elites and unleashed data miners, dark ads and bots on an unwitting public. After years of soundbites about connecting people, the social media giants are only just beginning to admit to the scale of the problem. We stand on the precipice of an era where switching your mobile platform will have more impact on your life than switching your government. Where freedom and privacy are seen as incompatible with social well-being and transparency. Where your attention is sold to the highest bidder. Our laws don't cover what is happening and our politicians don't understand it. But if we don't fight to change the system now, we may not get another chance. 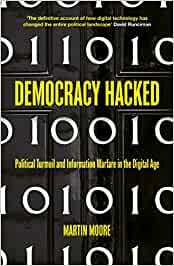 Empieza a leer Democracy Hacked en tu Kindle en menos de un minuto. 4,0 de 5 estrellasWell written book on how the digital age is has been manipulated by the political sphere. This is a well written book that provides background on how the digital age is, and has been, influenced and manipulated by the political sphere. However, the focus appears to be a bit left of center. If you feel that Republicans and Russians hacked the 2016 election, this book is for you. If you're looking to find an equally critical story on the Obama social media minions, this book will not fulfill - aside from a brief discussion on White House social media propaganda. Overall, Moore offers an informing story that helps the reader understand how democracy has been hacked by the digital age, and who some of the main players are, both public and private. This is the best, most comprehensive book of this sort that I’ve read so far. Thoroughly researched and well written. As the other reviewer has said, I wouldn’t make it your only source - it covers a lot of ground and is clearly trying to make a point rather than simply presenting the facts, so is a little off/unbalanced in its descriptions of US political frameworks, the discussion around Aadhar in Inda, the efforts of the US tech companies, etc. That said, it is the most comprehensive, thorough argument about the impact of technology on democracy that I’ve read so far and anyone working in that field should read it. I listened to it on Audible but have just bought the hard copy as I expect it’s going to be an important reference book for me.